Subacromial impingement syndrome (SIS), sometimes referred to as shoulder tendinitis, is a painful condition in which certain structures in the shoulder become compressed by bones in that region. Patients with SIS are usually managed with of a number of nonsurgical treatments, including rest, injections and physical therapy. In most cases, surgery is only considered for patients that do not improve after attempting several nonsurgical treatments. 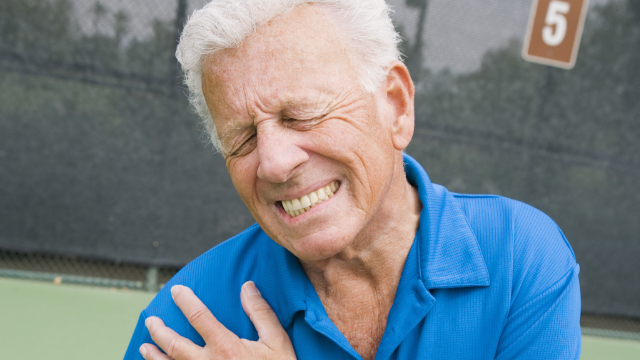 After surgery, physical therapy is typically recommended to help patients regain shoulder function. Although this approach is commonly utilized, there is no consensus about the most appropriate strategy, and little is known about the effectiveness of different types of exercise programs. It’s also possible that patients who have trouble returning to normal activities may require additional efforts to help in their recovery. For this reason, a high-quality study called a randomized-controlled trial (RCT) was conducted. In this RCT, patients with SIS who had surgery were randomly assigned to one of two treatments to determine which was more effective for helping them recover. Patients with SIS who had a surgical procedure called arthroscopic subacromial decompression were recruited for the study between 8-12 weeks after surgery. A total of 126 patients fit the necessary criteria and were randomly placed into either the physical therapy group or the usual care group. Patients in the physical therapy group followed a program that consisted of a combination of both supervised training sessions and home-exercise training. They received between 8-15 training sessions during the first eight weeks. Over the next four weeks, the frequency of these sessions varied depending on how patients responded, and they were told to perform their home exercises more regularly. Sessions lasted up to one hour each which consisted of aerobic exercise on a stationary bicycle, manual therapy performed by the physical therapist, and seven exercises that specifically targeted the shoulder. Patients were also instructed to become physically active at a moderate or high intensity for at least 30 minutes three times a week. Patients in the usual care group did not receive any specific treatments, but were told to continue the postoperative treatments recommended by the hospital. All patients were assessed before being assigned to their groups, and then again three and 12 months later for a variety of outcomes, including strength, range of motion and quality of life. Results showed that after 12 months, patients in the physical therapy group improved significantly more than those who received usual care. This was based on better questionnaire scores showing that patients who had physical therapy had improved shoulder function and less fear about their condition than the other group. They were also found to be more physically active and had a better overall impression of the changes they experienced from treatment. This RCT, which is the largest study that’s ever been performed on the topic, clearly shows that physical therapy leads to numerous improvements for patients with SIS after having surgery. Based on these findings, physical therapy should be considered a necessary component of recovery following surgery, and it’s recommended that a treatment program similar to the one used here is followed to increase the chances of a positive outcome. Copyright 2019 Caroline Konnoth Physical Therapy, All Rights Reserved. Powered by E-Rehab.